"Sedge" redirects here. For other uses, see Sedge (disambiguation). 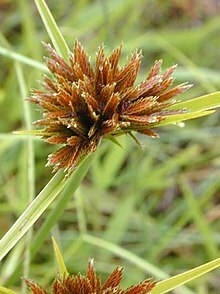 The Cyperaceae are a family of graminoid (grass-like), monocotyledonous flowering plants known as sedges, which superficially resemble the closely related rushes and the more distantly related grasses. The family is large, with some 5,500 known species described in about 90 genera, the largest being the "true sedges" genus Carex with over 2,000 species. These species are widely distributed, with the centers of diversity for the group occurring in tropical Asia and tropical South America. While sedges may be found growing in almost all environments, many are associated with wetlands, or with poor soils. Ecological communities dominated by sedges are known as sedgelands. Features distinguishing members of the sedge family from grasses or rushes are stems with triangular cross-sections (with occasional exceptions) and leaves that are spirally arranged in three ranks (grasses have alternate leaves forming two ranks). Some well-known sedges include the water chestnut (Eleocharis dulcis) and the papyrus sedge (Cyperus papyrus), from which the writing material papyrus was made. This family also includes cotton-grass (Eriophorum), spike-rush (Eleocharis), sawgrass (Cladium), nutsedge or nutgrass (Cyperus rotundus, a common lawn weed), and white star sedge (Rhynchospora colorata). ^ R. Govaerts; D. A. Simpson; with J. Bruhl; T. Egorova; P. Goetghebeur; K. Wilson (2007). Word Checklist of Cyperaceae: Sedges. Royal Botanic Gardens, Kew. ISBN 978-1-84246-199-0. ^ "Sedge family – definition and more from the free Mirriam-Webster Dictionary". Mirriam-Webster. Retrieved 25 December 2013. ^ Milne, Lorus Johnson; Milne, Margery Joan Greene (1975). Living plants of the world. Random House. p. 301. ^ Hipp, Andrew L. (2007). "Nonuniform processes of chromosome evolution in sedges (Carex: Cyperaceae)" (PDF). Evolution. 61 (9): 2175–2194. doi:10.1111/j.1558-5646.2007.00183.x. ISSN 0014-3820. PMID 17767589. ^ "Grasslike non-grasses". Backyard Nature. Retrieved December 30, 2014. ^ Ball, Peter W.; Reznicek, A. A.; Murray, David F. (2002). "Cyperaceae". In Flora of North America Editorial Committee (ed.). Flora of North America North of Mexico (FNA). 23. New York and Oxford – via eFloras.org, Missouri Botanical Garden, St. Louis, MO & Harvard University Herbaria, Cambridge, MA. ^ Brian R. Speer (September 29, 1995). "Glumiflorae: More on Morphology". University of California, Berkeley. Retrieved March 23, 2007. Look up cyperaceae in Wiktionary, the free dictionary. This page was last edited on 4 April 2019, at 22:37 (UTC).